Doctors bribed GSK, one of the world's largest healthcare and pharmaceuticals companies, admitted to promoting antidepressants Paxil and Wellbutrin for unapproved uses, including treatment of children and adolescents. Andrew Witty GlaxoSmithKline chief executive The illegal practice is known as off-label marketing. "The sales force bribed physicians to prescribe GSK products using every imaginable form of high-priced entertainment, from Hawaiian vacations [and] paying doctors millions of dollars to go on speaking tours, to tickets to Madonna concerts," said US attorney Carmin Ortiz. Andrew Witty, the firm's chief executive, said procedures for compliance, marketing and selling had been changed at GSK's US unit. "We have learnt from the mistakes that were made," Mr Witty said. "When necessary, we have removed employees who have engaged in misconduct." Four pharmaceutical companies paid more than half of the $19.8 billion in civil and criminal settlements the last 20 years for improper billings to federal and state governments, according to a report Thursday by Public Citizen’s Health Research Group. “Step aside, defense industry, there’s a new defrauder in town,” the group said on its Web site with the release of a 35–page report. While the action used to be at the Pentagon, now it is at the Department of Health and Human Services. The drug industry has overtaken defense as the main target of federal investigations for fraud, the report notes, especially in the last five years, when $14.8 billion of those civil and criminal payments were made. Four drug makers – GlaxoSmithKline, Pfizer, Eli Lilly and Schering-Plough — accounted for $10.5 billion of that amount, the report said. The study was the first to tally all criminal and civil settlements of at least $1 million during the last 20 years. In some of those cases, companies denied illegal activity such as fraud and kickbacks while making major payments to settle investigations, and the government agreed to settlements rather than pursue the cases further. Pfizer holds the record for the largest criminal fine in United States history, $1.3 billion, and the largest health care fraud case, $2.3 billion including the criminal fine, from a settlement last year involving its marketing of the painkiller Bextra and other drugs. Another one joined the list on Wednesday when the government announced the Irish drug maker Elan had agreed to pay $203.5 million, half in criminal penalties, half in a civil payment, to settle an investigation of its illegal marketing of the antiseizure medicine Zonegran. Elan sales people had promoted it for weight loss and mood disorders. The study covered False Claims Act violations, where companies are found to have encouraged improper medical billings by marketing drugs for uses not approved by the Food and Drug Administration, as well as Medicaid fraud against states. 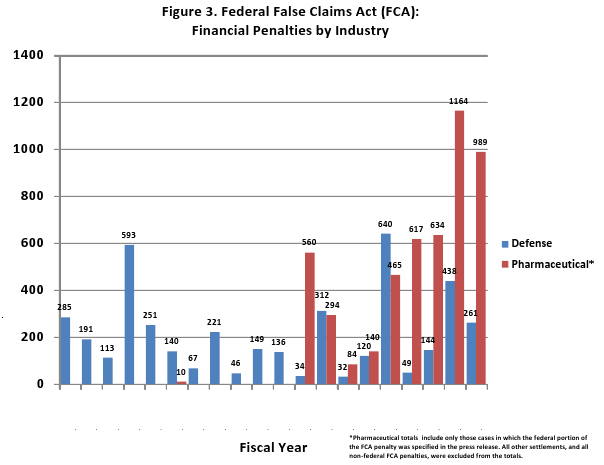 Financial Penalties by Industry (click to expand graphic) The report was written by Dr. Sammy Almashat, Dr. Charles Preston, Timothy Waterman and Dr. Sidney Wolfe. The research group is part of a national nonprofit founded by Ralph Nader in 1971. There are many reasons for the drug industry’s prominence as a target of federal and state investigations. For one, the money: U.S. health care spending has soared above $2 trillion a year, about one-sixth of the gross domestic product and more than one-third of federal spending. For another, the opportunity: drug companies and their sales staffs can make much more money by bending or breaking the rules on off-label marketing. This has proved especially true in recent years with illegal marketing of expensive antipsychotic medicines. Drug marketing rules come in shades of gray, and individuals are almost never charged. And finally, the bounty: industry whistle-blowers can claim a part of the settlements when they help the government bring false claims cases. Such whistle-blowing activity has accounted for two-thirds of the payouts in the last 10 years, the report says.